An oasis in the mountains: The ALPIANA RESORT is beautifully situated aloft Lana near Merano (14 km) and delights wellness fans, active holidaymakers and gourmets alike. An architectural highlight with Mediterranean pool garden and the South Tyrolean Mountains as backdrop. Clear design meets true hospitality here. 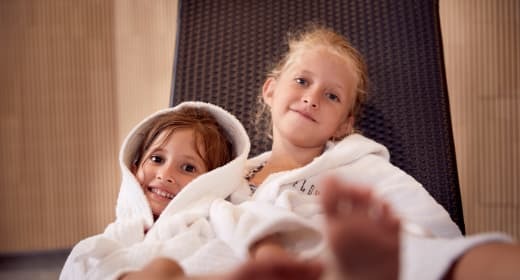 The new ALPIANA RESORT is a family business run with passion! The Hotel Völlanerhof was the anchor of calm for guests in search for relaxation, the ideal starting point for thrill-seekers and a place where a holiday in South Tyrol was made complete for over 40 years. Four decades full of encounters, adventures and emotions. Quality before quantity is still the motto for the new stage of our family project. The ALPIANA pool gardens and oases of tranquillity provide time and space for real relaxation and wellbeing. The kitchen of ALPIANA RESORT only prepares dishes with ingredients according to what the season and local landscape provides. There is only one principle: it has to be homemade. Mountain bikers, racing cyclists, E-bikers and leisure cyclists... Welcome to the biking paradise Merano Region. The ALPIANA RESORT: a wonderful starting point for discovering South Tyrol’s world of golf. New pro and caddy room for your golf bags and golf equipment. Fun and games for everyone, family time and time for two... unforgettable holiday adventures. “Love is the essence of life. That is why moments together should be consciously and gratefully dedicated to love." ALPIANA RESORT receives the Wellness Heaven Award 2015 in the category "Culinary Delights"
Here you will find the rooms and prices of Hotel Alpiana Resort in Völlan. Here you can find the offers and packages of Hotel Alpiana Resort in Völlan.